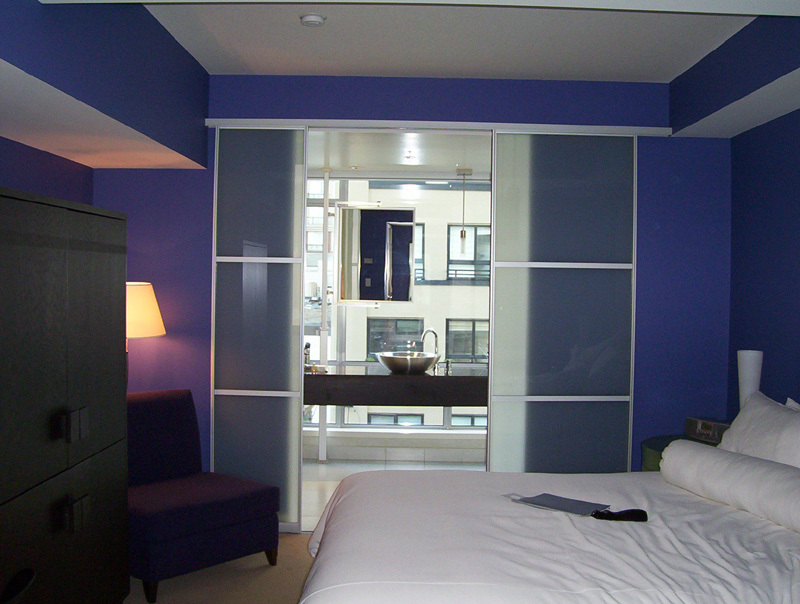 Many months ago, my sister gave me for Christmas a one night stay at the Opus Hotel in Yaletown. It was a very thoughtful and expensive gift but I had no opportunity to cash in on it while I was living out by UBC. Since the gift certificate was to expire at the end of December and since I’ve been exiled to the wastelands of suburbia, I booked a room and stayed downtown this past Saturday. It also helped that Adam’s farewell evening was also on Saturday. For once, I wouldn’t have to worry about making the long trek back to the suburbs after an evening out with friends. I checked into the hotel around 3:30pm or so. I’ve been to the Opus before: once at the Elixir restaurant for dinner (pricey!) and also at the hotel bar for drinks. Some of you long-time readers might recognize the Opus bar as the last stop before Behennah and Woba drove off to Seattle at 2am on a whim. I was give what turned out to be a “superior room“. The Opus is considered to be a boutique hotel, meaning it’s smaller than your average chain hotel, it’s supposed to offer higher levels of service, and of course, it’s going to cost you more. My room was unlike any other hotel room I’ve been in. 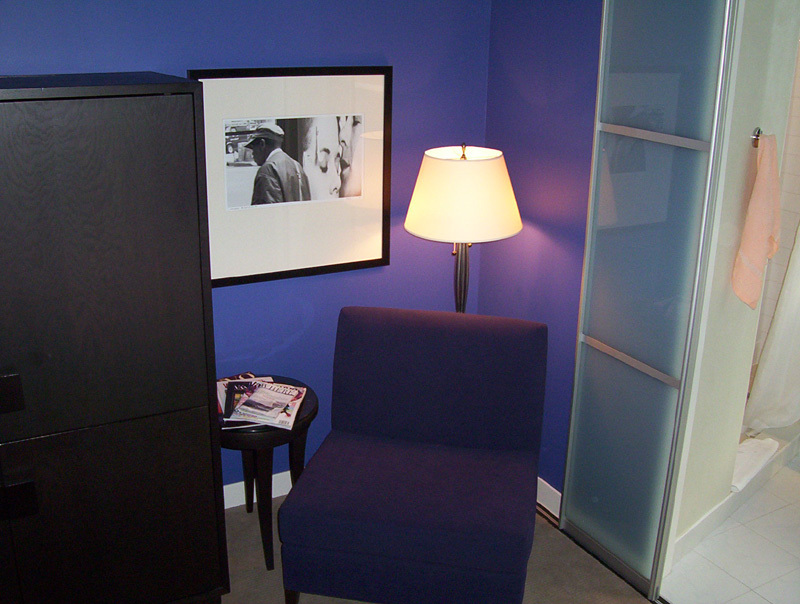 Rather than your standard white walls, the room had a bluish colour theme to it. The bathroom was the most interesting part of the room. 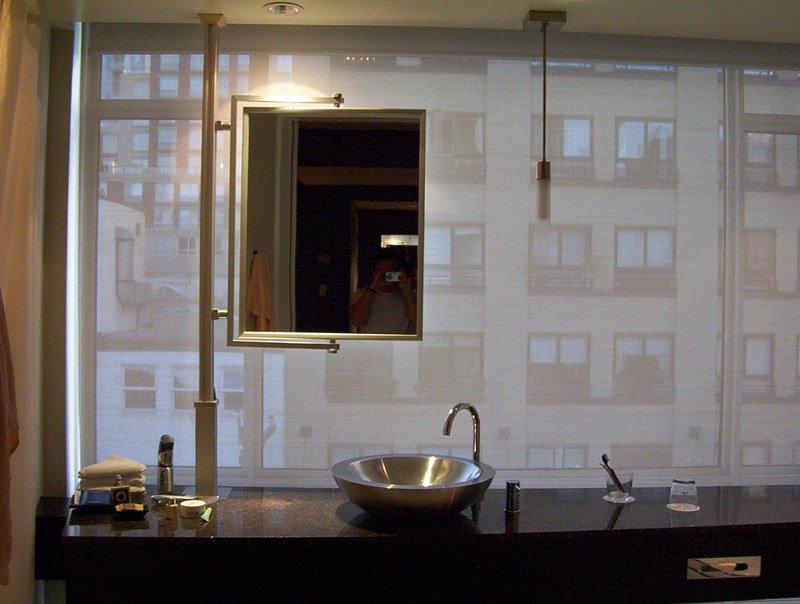 In your standard hotel room, the bathroom usually has no windows. In my Opus hotel room, the only windows in the room are in the bathroom. 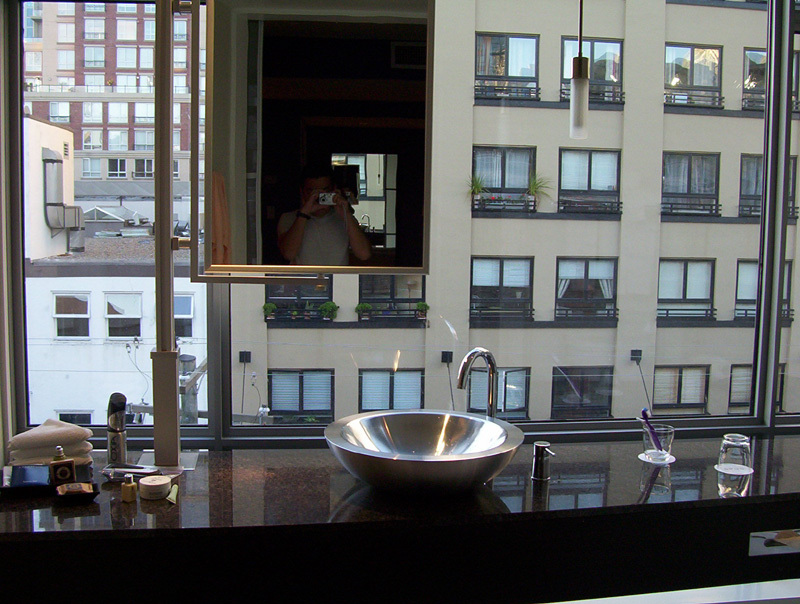 The bathroom had floor to ceiling windows and was the only place you could go if you wanted to look outside and onto the street. Obviously you would need some privacy if you wanted to do your business and that’s where these two windows screens come in. One screen was like a partial light filter that obscured some of the view but could still let silhouttes show through. There was also another one that was completely opaque that gave you the most privacy. For the record, I felt comfortable enough to tinkle with only the partial screen down. The bathroom tiles were also heated to a temperature of your desire. There wasn’t a tub to soak in but the shower was shaped like a wedge that easily could have fit two people. There’s also no bathroom door. 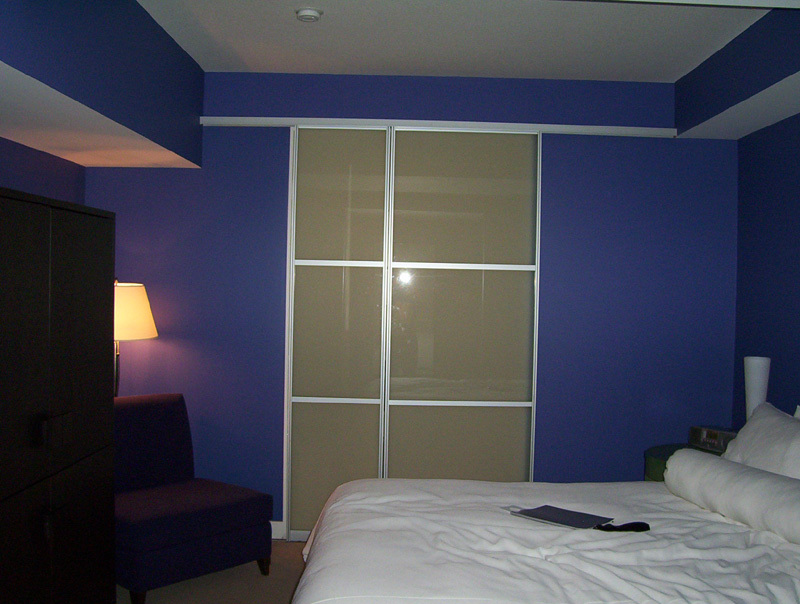 Two Japanese style sliding doors serve as the only way to separate the bathroom from the rest of the room. 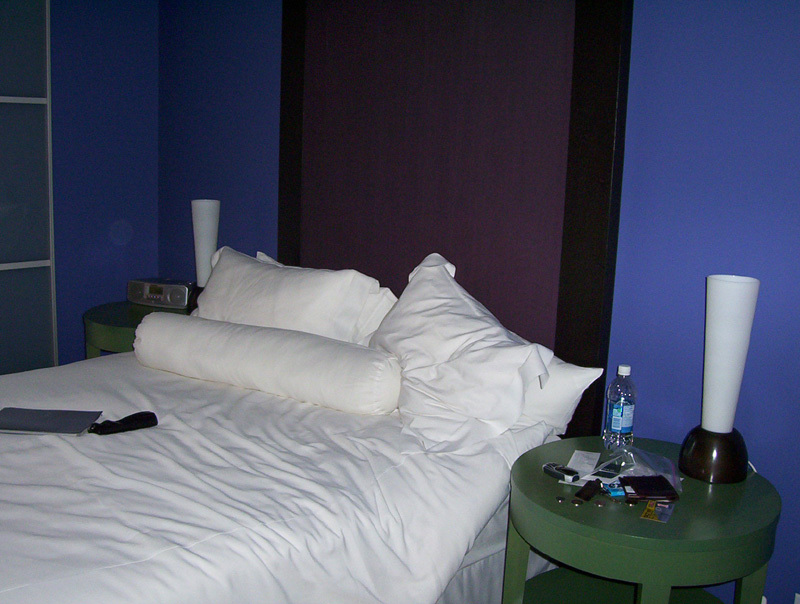 The rest of the room was nicely appointed and the queen sized bed was quite comfy. There was an in-room safe, ironing board, iron, TV, hair dryer, and umbrella. Also available was this oxygen canister that you could take O2 from at $8 per hit. How trendy! Room service can be had at all hours of the day and night. I quickly flipped through the menu where I discovered a BLT sandwich with fries would have set me back $15 not including the $3.50 delivery fee plus taxes and gratuities. Local calls were $1.25 per call and there was a high-speed internet port at the desk ($16 for 24 hours of access). When I returned to my room after the evening out I discovered they also have a turn down service. A card displaying tomorrow’s weather forecast was placed on the bedside table as was two chocolates on the bed. They do treat you nice at the Opus and everything is very cosmopolitan and modern. This does come at a price, starting at around $200 a night. If you have the cash, I’d recommend the hotel for sure but for those on a budget, there are better values out there. P.S. When I returned to my hotel room at around 2am, there were tons of people still out on the street downtown in their costumes. It’s weird, but it appears that to women in their 20s, “dressing up” for Halloween means wearing anything plus a tiny, short skirt and knee high boots. Where was I when that memo got sent out? 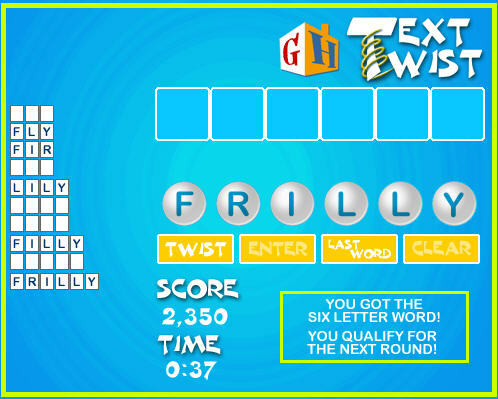 No time for a big post tonight since I’ve whittled away all my time tonight playing Text Twist. It just goes to show you it’s not necessary to have all the fancy bells and whistles for a game to be addictively good. It been a while since I’ve had a nice slice of strawberry shortcake. My favourite place to go for that is True Confections. I wonder if you can get it when it’s not summer time? I started watching Land of the Dead at around 1am last night. That was a big mistake. I have a fondness for zombie movies. I told myself I’d stop watching at 1:30am. It wasn’t until 2am that I turned it off. It’s about 12:30am now and I’m thinking about watching the rest of it before I go to bed. That would be an unwise move given I have to work tomorrow. Hey, by the way, the movie stars Simon Baker who was born in Australia. 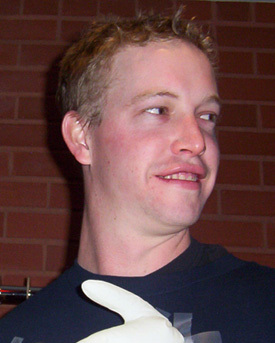 There was a guy that used to live in SJC named James, also from Australia. At least in my opinion, there’s quite a resemblance. The bus to work was surprisingly empty this morning. I got a seat all by myself where I rode in comfort all the way downtown. When I got to work, there were lots of people who stayed home sick from apparently the flu. I’m not sure if it was that avian kind that the news keeps talking about. For lunch, I went to Bimini’s. I had the BBQ chicken burger. I indulged myself with fries and gravy as my side. It was decadent. Right before I left work, Tim showed me this horrendous bug in a part of the game that I wrote code for. It nagged me but I had to leave it for the next day since I had to go catch a bus downtown. I wanted to get some pants into the alteration place before they closed. I then went home and made dinner by myself since everyone else had gone off to do other things. And that my friends, is a day. If you’ve been following an earlier post, you know that I had planned for Friday night to be the time that I’d clear my name with Meghan/Megan, the Swiss Chalet server. Prior to the 7pm meeting time with the boys at the Chalet, I had printed out a portion of my bank records to show Meghan/Megan that I had indeed paid for my meal. I arrive at the Chalet a few minutes after 7pm to find the Adam, Tyson, and Derm sitting at the bar portion of the restaurant. I thought we were going to sit in her section so I asked Adam what the deal was. Apparently, the restaurant was quite full so the bar was a quicker way to get a table. No problem. After ordering our food, I brought out my bank statement and went up to the front of the restaurant. There were two hostesses awaiting me. I asked to see Meghan/Megan and they both kinda had puzzled looks on their faces. One of them said she wasn’t sure if she was working tonight but that she’d go in the back and check. I was left with the other hostess who I gave an explanation as to why I wanted to see her. Shortly, the other lady came back and informed me that Meghan/Megan was indeed not working that evening. Bummer. She wasn’t even sure if she’d be in the next day. I had to bring the statement back to our table where I informed the guys of the news. The truth will have to wait for another day. On the other hand, I had an excellent double leg dinner. Inexplicably, my voice mailbox account for my phone number just disappeared. If you’ve been calling my number and not getting my voice mail, that’s why. I’m going to get this all straightened out very soon, believe you me. To be fair, a link to a short bio exists on my main page which would take ten minutes to add to my blog. Maybe someday in the near future, I’ll go and do that. I mulled over the idea of having a photo when I first started my blog but being the Adonis I am, I wanted my words to be the focus not my chiseled looks. Hey, that’s an erwintang.com hallmark. Ain’t no way that’s changing. This is true. Some of my best work is buried in the archives. I’ve been thinking about publishing a “best of” series. Guilty as charged. This is a limitation of blogger itself. I’m not sure if I agree with this one. The best thing about having a blog is I can write about anything I want. If you own a blog, go and see how yours does against the list! I don’t have the time to post anything of importance today. Oh wait, maybe I’ll just say that I think Bill O’Reilly is a douchebag. Damn, that wasn’t very nice. Perhaps I should have said his opinions evoke an emotional response in me. That’s better. Web site thedigitalbits.com recently attended a media event at both Skywalker Ranch and the Letterman Digital Arts Center in San Francisco. Both properties are owned by George Lucas. Until recently, famous Lucas companies such as ILM and Skywalker Sound were based on the Ranch. This summer, they moved everything to a new campus near the Presidio. Click here for a photo tour of both facilities. Notice how clean and well-maintained everything is not to mention the lightsabers in display cases. Also, don’t miss the statue of Yoda on the fountain. If you want to know more about the Letterman Digital Arts Center, point your browser here.